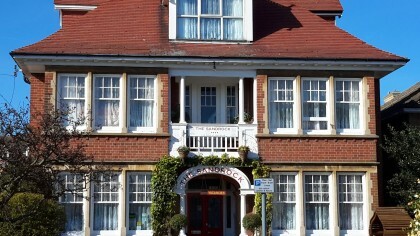 The Sandrock Guest House. Terms & Conditions. Jan 2014. You are invited to read our Terms & Conditions and note our Guests responsibilities. These T & C are applicable to all of our guests or agents. ( an agent being someone booking on behalf of a guest). Card details are needed to secure your reservation. Payment is made at the time of check in on your day of arrival. Card details are kept until the day you depart in case of additional charges. If a guest needs to cancel a reservation, at least 7 days prior notice is required, a cancellation has to be acknowledged by The Sandrock. 90% payment will be charged. Every effort will be made to re-let your room/rooms in full or part which ever we achieve. A refund will be returned to your card. No shows are the same. Being a Guest House we do not have a 24 hour reception. Arrival is the day your stay starts at The Sandrock, check in times are between 4.00pm and 7.00.pm. Or any other time to be agreed by prior arrangement. Say your train arrives at 2.00.pm or you’re going to a wedding, just let us know especially if you’re going to be late. We do go out to socialise. Departure is the morning you leave. The Sandrock check out time is by 10.30.am. Thank you. Our car park is first come first served; please park considerately. Only one car per room when space is available. Parking ends at the time of your check out, which is 10.30.am. Thank you. Paying Guests only are allowed in bedrooms, friends and Family are allowed to wait by the reception. No anti social behaviour will be tolerated. We are a non smoking building, anybody that does smoke within the building will be ejected from the building permanently. No refund will be given for days or part days lost of a reservation. Further costs could be incurred by a guest who smokes in the building for extra cleaning, loss of income for The Sandrock if a new Guest refuses to take a room that a previous guest has smoked in. £100 fine plus extra cost for cleaning. Hanging out of the window or blowing smoke into the ensuite extractor is so obvious.Just don’t do it.We have ejected guests. Lost or non returned keys are expensive, any guest that looses there room and front door keys will be charged for a new room lock and front door barrel and 22 new keys. Guests who forget to return there room & front door keys will be given 3 days to return them to The Sandrock. Any damage/excessive spillage beyond fare ware and tare caused by guests will be charged for. eg, hot iron marks, flooding in ensuites ets. Excluding broken glasses, easily removable dirty marks etc. Please tell us of any mishaps, as said accidents do happen. These Terms and Conditions are on display in our reception. These T & C are written for those guests who have no respect for other peoples property which fortunately are few and far between. We are sure this is not you.